History of Rajasthan is full of heroic tales. The forts and fortresses along with the famous palaces have witnessed the grandeur and valour of Rajasthan. To understand the history is an interesting way, the children were taken on an Excursion trip to "Chittorgarh Durg". This fort is the largest fort in India and the grandest in the state of Rajasthan. The children saw 'Padmini Mahal', 'Kirti Stambh', 'Vijay Stambh', 'Meera Mandir', 'Suraj Pol' and 'Fateh Prakash Museum'. It became a unique celebration when Santa Claus appeared at "Kirti Stambh" and distributed Christmas cakes to children. Children thanked director Mr. Akin Choudhary and principal Mrs. Sadhna Mishra for giving them an opportunity to see all the spots that created history by organising such a fun filled trip. Christmas brings joy for everyone. Children eagerly wait for Santa Claus with a hope that their prayers will be reciprocated with gifts brought by Santa. People make merry and enjoy Christmas with fun filled parties. Pre- Primary children of WIS Bhilwara turned up in party dresses to celebrate Christmas on 21 Dec. 12. Senior Kg children enacted the story of the birth of Lord Jesus. A cribb was beautifully decorated with Mary Joseph and infant Jesus. Christmas carols were very beautifully presented by Nursery and Junior KG children. The programme ended with song Jingle Bell where the entire pre-primary section sang and danced with Santa Claus. Directors Mr. Akin Choudhary and Mrs.Shilpa Choudhary extended their blessings and best wishes to the students and staff members. At the end Principal Mrs. Sadhna Mishra wished everyone a Marry Christmas and a Happy New Year. The little angels of Nursery enjoyed the activity of Shape Parade Day where they brought placards of different objects which were made from different shapes. The verbal skills of the little Witty children were enhanced who came in front of their peers and spoke a few sentences about the objects got by them. The tiny tots of Witty enjoyed celebrating Christmas in its own unique way. They went for a field trip to Shepherd Memorial CNI Church, where they enjoyed watching a tableau of Jesus Christ and understanding that why is Christmas celebrated. The children were welcomed by the Santa Claus who wished the children “Merry Christmas”. The children were given gifts by Santa which added a smile on their face. The children enjoyed wishing each other Merry Christmas. Christmas, the joyous festival of laughter, mirth, fun and frolic was celebrated in the school with great enthusiasm. Students through their one act play depicted the essence of the festival and existence of Santa as a messenger of Lord Jesus. The short skit enlightened the students on the story of the great Saint Nicholas who is much admired for his piety and kindness. It is said that he gave away all of his inherited wealth and traveled the countryside helping the poor and sick. 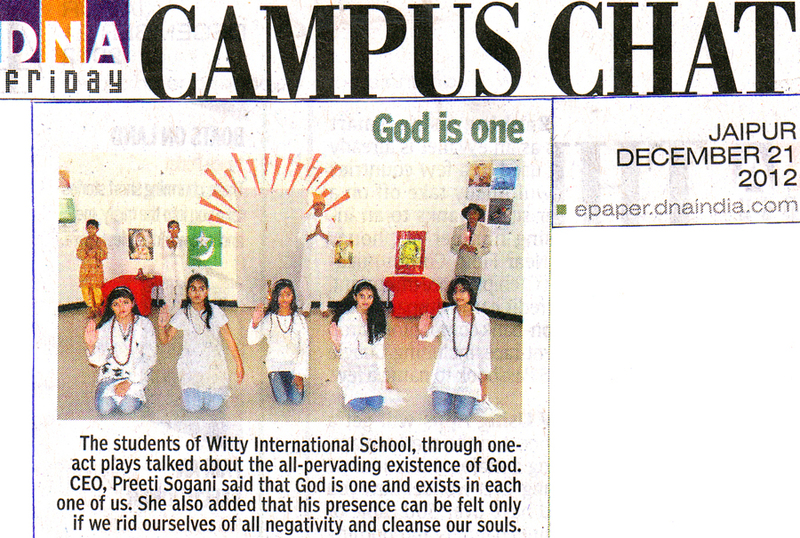 Students sang melodious carols and presented a mesmerizing dance number to welcome the New Year. The pre primary wing of WIS visited the Shepherd Memorial Church. Everybody greeted Santa with cheers and was happy to receive Chocopies from him. Guests of Honour for the day were Dr. Anil. Sogani and Dr.Anita Sogani from USA. In their message they conveyed that secularism amongst the students could easily be seen and was praise worthy. Directors Mr. Dependra Sogani and Mrs.Preeti Sogani Sogani extended their blessings and best wishes to the students and staff members. Principal, Mrs. Shubha Govil wished the Wittians a merry Christmas and a very happy New Year and conveyed to all students to spread the message of universal brotherhood all around. Around 1950 a Swiss accordion player Werver Thomas inspired by his own flock of ducks and geese composed some music. In 1963 he played the music in his own restaurant. The immediate reaction was that the people began to move with the music. The actions included beak, wings and taut motions. In late 1990 s it became very popular and became the part of every party. In a Disney Version Mini Mouse dances to the tune. Children pretend to be birds and bounce happily enjoying the music that progresses faster and faster. Children enjoyed the Birdie Dance. In the end the parents also tapped their toes along with their children. The Principal thanked all the parents and asked the parents to live their childhood with their children allowing them to have the freedom of growing at their own will. The maxim Wittians believe in is not only acquiring knowledge but also retaining it with the moral values that a true human being should have. The thought come into existence when the young Wittians through their one-act play depicted the existence of God in each one of us. They staged that it is we, the human beings who have given His existence different sects as per our convenience and motives, but the reality is that He lies in us and we need to put all our faith in Him. 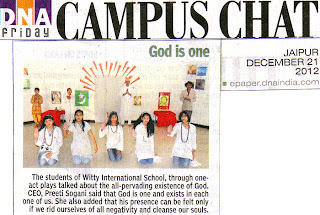 Principal, Mrs. Shubha Govil in her message conveyed to the Wittians that it is true that God is one and His existence lies in each one of us and that can be felt if we make our soul pious and free from all evils.